The match started evenly but KGVI settled down quickly to offer something for the thousand plus spectators who turned up to be excited about. Harrison Mala was the danger man for KGVI just as he was for KOSSA in the last Telekom S-League season. 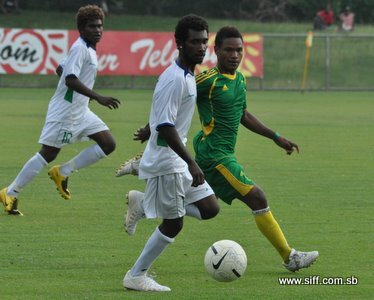 However, his national U-17 teammate Atana Fa’arodo Jnr. was the first on the scoreboard after he volleyed home a pint point corner kick from Fredrick Dola after 20 minutes. KGVI’s lead was extended to 2 – 0 when Mala stole a poor back pass from an Aligegeo defender then turned to beat another opponent before speeding into the penalty box where coolly slotted the ball past the advancing goalkeeper. It was a brilliant individual effort from Mala who cleverly anticipated the back pass and moved to the right position to pick it up. Without most of their key players Aligegeo had few opportunities to attack but a rare moment inside the KGVI penalty box saw them draw one back. Oswin Bwagi provided the impetus with a hard drive towards goal and a shot on goal which rebounded off Phillip Mango but the follow up from Allan Parirore was good enough as the ball took a deflection before spinning into the roof of the net. Aligegeo almost followed up with another goal just minutes later but Parirore got his bearings wrong this time and the shot sailed high above the crossbar. The cost of the miss became all to clear when Mala sent home KGVI’s third goal of the game after some fine short passes outside the Aligegeo penalty box just before halftime. The second half was as action packed as the first half but only one goal was scored as determined defending from both teams made attacking difficult. KGVI were the fortunate ones as they extended their lead to 4 – 1 midway through the second half. Both teams made substitutions as the match went on but neither side could score any more goals. SIFF special projects manager, Phillip Ohoto’ona was pleased with how both teams played and said that he is sure that some of the players have made a mark with selectors from local and national league clubs. “Both teams played well this afternoon and this speaks greatly of the hard work of the coaches who worked with them for the last 3 years. I am confident that a number of these players will make it into clubs here in Honiara and probably feature in the national soccer league,” Ohoto’ona said. Earlier in the afternoon a curtain raiser match featured a combined KGVI and Aligegeo LEARN&play team take on a combined KOSSA and Koloale team. The KOSSA/Koloale team won the match by 2 goals to nil.